The speed and precision of laser welding and cutting has significantly boosted its popularity in the manufacturing and fabrication industries over the last several years. The time and manpower the processes save are undeniable. However, the dust and fumes that are produced can be extremely dangerous, not only for the people working in the plant, but also for the accuracy and longevity of the equipment. By utilizing a high-efficiency source capture air filtration system in conjunction with other complementary equipment, indoor air quality can dramatically improve in a facility and several other advantages can be realized. While the initial investment may at first seem unnecessary, the long-term benefits include higher productivity, energy savings, extended filter life, reduced maintenance and a safer facility. Lasers require an extremely clean environment or the process will not function properly. Smoke and fumes that aren’t properly extracted can be problematic for lasers. Airborne particulates can reduce the intensity of the laser by diffusing the beam. They can also settle into the weld seem and diminish the integrity of the weld. Many laser welders also require light-tight enclosures to prevent the beam and dust from escaping the weld area. If there isn’t adequate dust and fume extraction, the particulates will settle on the equipment and can cause damage. This can lead to frequent maintenance issues, unplanned production downtime and reduced laser life. The most compelling argument for air filtration, however, is the serious health risks associated with inhaling fumes and dust created by laser processes. Because these fumes often contain toxic materials and because the airborne particulates are so small and so fine, they can easily be inhaled deeply into the lungs. Over time, the health impacts can become chronic and severe. Manganism is a serious neurological disorder that can also result from chronic exposure to weld fumes containing manganese. It is often mistaken for Parkinson’s disease, multiple sclerosis (MS), or amyotrophic lateral sclerosis (ALS), also known as Lou Gehrig’s disease. Source capture solutions work best for laser cutting machines. 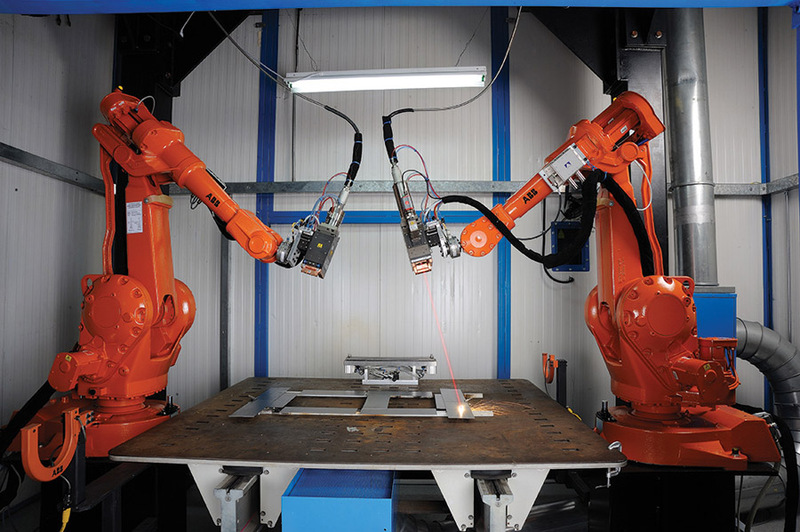 For robotic welding of smaller components, a hood or similar enclosure is the best option. It contains the fumes and prevents them from spreading throughout a facility. This protects workers from harmful particulates and clears dust away from laser equipment. It also limits the amount of air a dust collection system must process, radically reducing the energy required by the system. 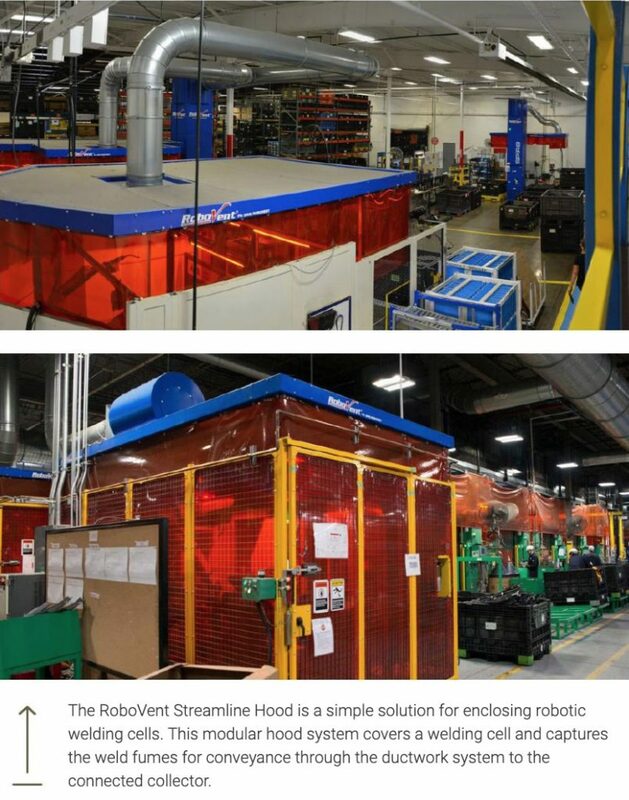 RoboVent’s Streamline Hood is a good example of such a system. Some hoods can be customized to fit nearly any laser welding or cutting operation. Sometimes overhead cranes or other equipment might preclude a full enclosure. In these situations, a partial enclosure might be all that is possible. Even a simple array of curtains and partitions can surround a welding cell enough to make a difference. None of this equipment is expensive or difficult to install, and the long-term benefits are substantial. To reduce CFM requirements and costs, make sure hoods are properly sized for the application. When an enclosure is simply not possible, robotic tip extraction is an option worth considering. In this application, the extractor tip is attached to a flexible hose that connects to a high-vacuum dust collector. 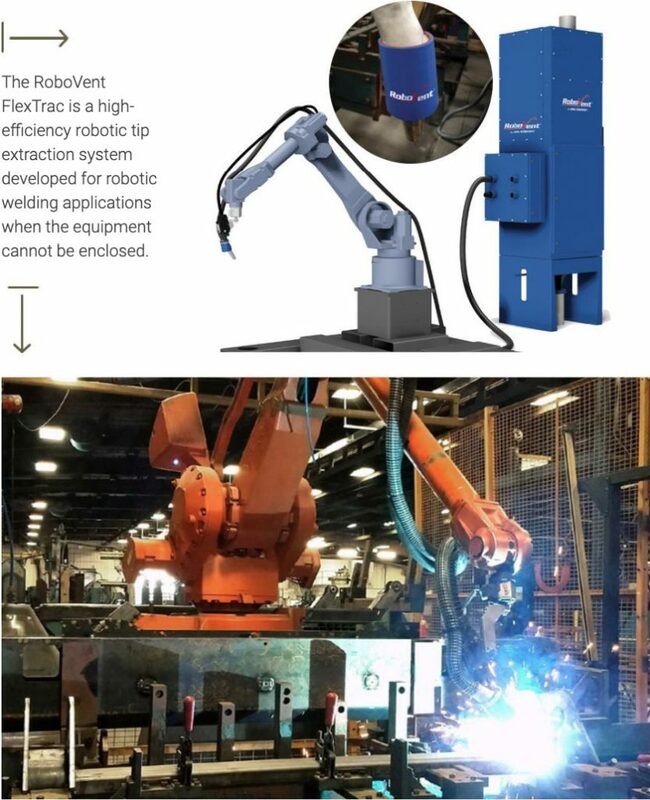 These systems can capture up to 70 percent of fumes as they are generated, but must be customized to the individual robot and application for maximum efficiency. 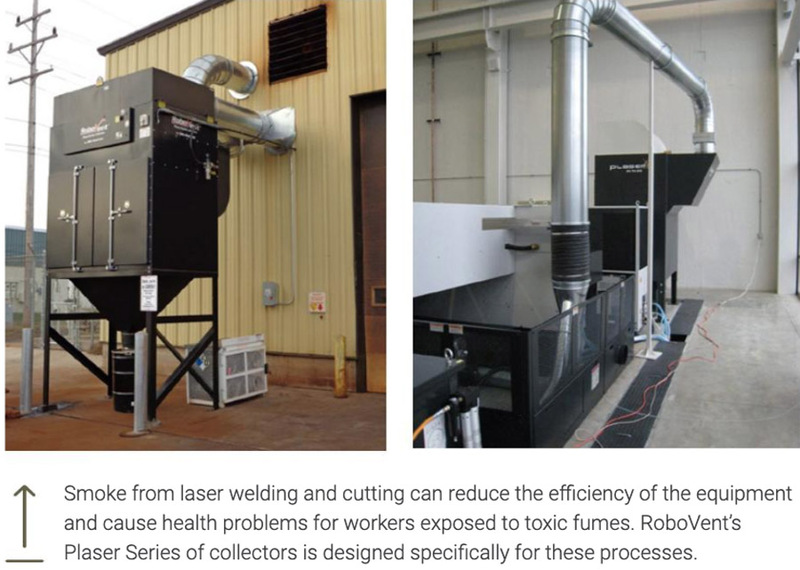 Whether laser cutting or welding, fume extraction is a necessity – for employee safety as well as processing quality. Ambient high-efficiency air filtration units are particularly useful systems used in combination with source capture systems. They can do a phenomenal job of collecting residual fumes that source capture systems might not catch. Well-placed, powerful systems can even clear the air on their own when source capture systems aren’t possible. One downside of an ambient-only air quality system is that workers may still be exposed to high levels of fumes in the breathing zone. Ambient systems will keep the facility’s air as a whole within regulations, but workers closest to the fume source may still have high exposure levels. Combining both source capture and ambient systems will help keep facilities cleaner and equipment running more efficiently. Smart and automated control systems may often seem like unnecessary (and costly) bells and whistles for dust collectors, but with careful design, they help dust and fume collectors run more efficiently than ever. Systems that turn on when they’re needed and turn off when they’re not yield obvious savings. For source capture of weld fumes, automated controls can be connected directly to the weld torch so the dust collector only runs when the weld torch is on. For ambient systems, smart controls connected to air quality monitors can turn the system on and off in response to real-time air quality conditions. Smart control systems use machine learning to automatically adjust system performance to save energy and extend filter life. Intelligent controls can also reduce maintenance costs by optimizing maintenance schedules based on actual system use and performance. Technologies like Variable Frequency Drives (VFD) automatically adjust the blower speed to compensate for filter loading, so you can use less energy when filters are new. This can add up to significant savings over time. Despite upfront costs, equipment such as robots and adaptive software are turning factories into smoothly running, highly productive automated facilities. Nearly every manufacturing environment has at least some risk of fire or explosion. This is especially true when processes produce sparks and combustible dusts. Because laser welding and cutting machines do both of these things, facilities that house these systems are certainly at risk and should take necessary precautions. One way to do this is to invest in a proper deflagration system. Explosion vents release excess pressure in the event of an explosion. They direct pressure away from the building to minimize the damage to people and property. Isolation valves are intended to stop pressure waves before they spread throughout and entire ventilation system, localizing the impact of an explosion. Rotary airlocks are designed to prevent explosions from spreading to the hopper and into a container full of flammable dusts. 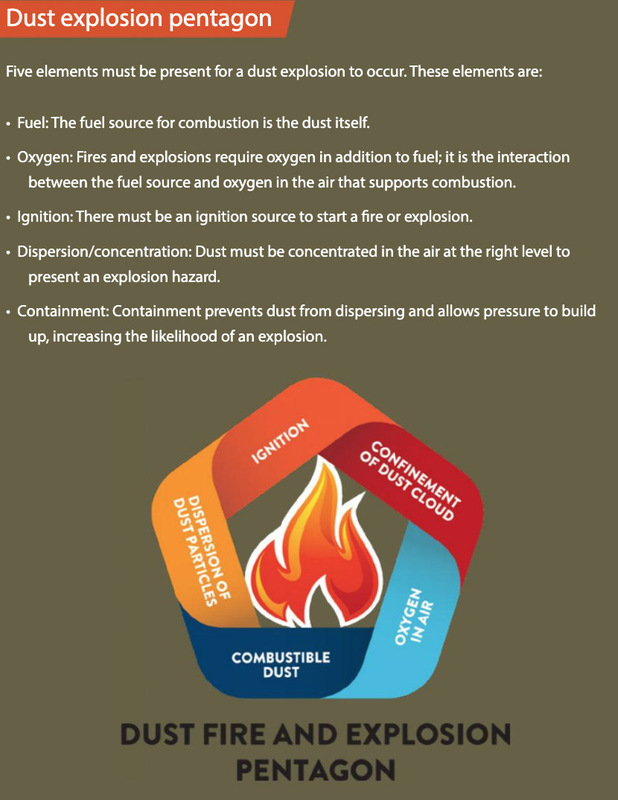 NFPA has issued several standards related to prevention of fire and dust explosions that manufacturers producing combustible dusts must follow. NFPA Standard 652, the Standard on Fundamentals of Combustible Dusts, provides an overview of required safety and risk mitigation practices. By combining high-efficiency air filtration with systems that protect the health and safety of employees, manufacturers can simultaneously improve the efficiency and effectiveness of existing equipment. At the same time, energy consumption can decrease, productivity can increase and businesses will see the investment was well worth it.